When Walter Duncan Bellingrath established a camp on the banks of the Isle-Aux-Oies (Fowl) River, some 20 miles south of Mobile, Alabama, in 1917, he did so with the idea of making a recreational fishing spot for himself and his friends. The wild countryside around consisted of native trees and shrubs—oaks, pines, sweet gum, black gum, tupelo, magnolia, sweet bay, bullbay, hickory, dogwood, holly, yaupon, ironwood, tulip tree, juniper, cedar, cypress, chinquapin, pecan, mulberry, sassafras, persimmon, cottonwood, wild olive, maple, alder, the rare gordonia and many others. Mr. and Mrs. Bellingrath little dreamed that on this same spot, years later, would stand one of the most fabulous gardens of our time. Because of their grandeur and magnificence garden-lovers often enquire about their origin. In 1927, the owners toured Europe to study renowned gardens there. Upon their return they were inspired by the primeval beauty of their own property and became filled with the idea of developing it. At this time, the Bellingraths were fortunate in securing the services of a friend in Mobile, Mr. George B. Rogers, Fellow of the American Institute of Architects. He designed and executed the building and laying-out of the enchanting flagstone walks, fountains, rockeries, balustrades and landscape effects. 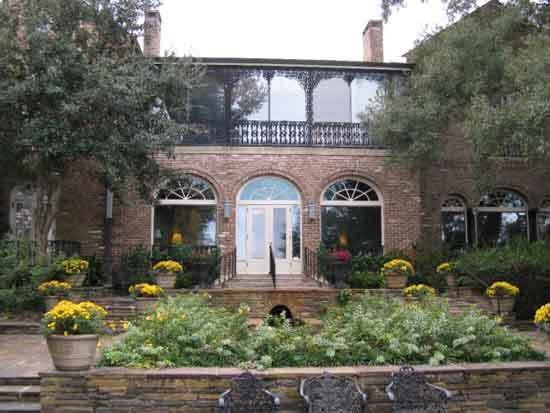 In 1935, he designed and built the Bellingrath residence. 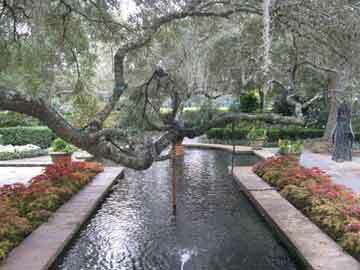 Endowed with a gift for excellent design, it was his interpretation of the owners’ dreams which resulted in the perfection of the Bellingrath Gardens. On the grounds, there are more than 2,000 mature specimens of Camellia japonica, undoubtedly one of the finest collections to be found anywhere in the Southland. All the large specimens were secured from private homes within a 300 mile radius of Mobile, exceptional care having been taken in the selection, grouping and planting to give a permanent and lasting landscape effect. These plants ranged in size from 12 to 20 feet in height and from eight to 18 feet in diameter. Many are 50 to 100 years old. During the past decades, numbers of outstanding new introductions have been added to the collection, which includes over 500 varieties. The colors of the flowers range from the purest white to delicate, pale pink and from rose-pink to a deep and sheeny crimson. Many are often variegated, with marked splotches or stripes of every description. No other flowering plant can give such a diversity of flowering types – singles, semi-doubles, doubles, peony types and some with pompom centers. Yet others have shaggy flowers, with center petals whorled and twisted. Camellias commence blooming in early September, continuing through the winter months into April a flowering period of nine months. Some individual bushes will bloom for six months, owing to the ideal climatic and soil conditions existing in the Bellingrath Gardens. Camellias also thrive luxuriantly under the partial shade afforded by live oaks and other native trees in a setting where it is dexterously planted in a breathtaking landscape effect along walks and driveways by the river and lake. Although Camellia japonica, a native of Japan, was introduced into Mobile through European channels more than 150 years ago, it is only during the early 1940’s it really has come into its own. Actually, since 1932, Bellingrath Gardens have placed so much emphasis on camellias through the winter months, that general interest in these flowers has virtually paralleled the world-wide renown of the Gardens themselves. Azaleas always present a lavish pageant of color when in flower, and nowhere in the world are they found in a setting so fitting as in Bellingrath Gardens. Many of the giant indicas were introduced into Mobile from Europe over 175 years ago. Between 1930 and 1940, Mr. and Mrs. Bellingrath acquired age-old specimens – many ranging from 12 to 15 feet in height and from 20 to 30 feet in diameter and transplanted them to their place. There are five groups or species of azaleas at Belligrath: indicum, rutherfordianum, kurume, macrantha and Belgian hybrids. Over 250,000 plants in more than 150 varieties have been planted in landscape effects that are indescribable. The colors range from pure white through pinks and reds into deep lavender and crimson, and many of the flowers of the colorful Belgian hybrids are strikingly variegated. The flowering period covers several months. Azalea simsii vittata and A. magnifica start blooming in early November. These are followed by the potted Belgian hybrids and A. millerfardiana, which bloom throughout the winter months. The early pink indicas usually burst into flower by mid-February. Then come the kurumes and the later blooming indicas, up into April. The sweet-scented, native azalea usually blooms in March, with colors in white, pink, yellow, cream and orange. The full glory of the azalea season, however, is generally from the middle of February until the middle of April. Beauty knows no season, however. Aside from camellias and azaleas, there is a never-ending, enchanting display of seasonable flowers and foliage plants every week in the year. 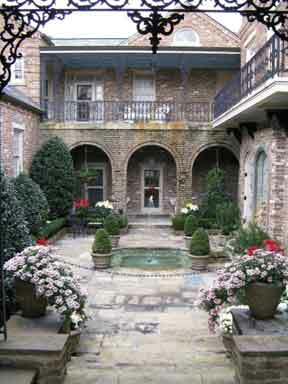 Throughout the winter months the large beds around Mr. Bellingrath’s residence are filled with potted plants from the extensive greenhouses. These include poinsettias, chrysanthemums, Easter lilies, cinerarias, yellow calla lilies, begonias, amaryllis and hydrangeas. In the borders and woodlands many attractive and beautiful shrubs and trees abound. There are dogwood, redbud, double-flowering spirea, Chinese magnolia, mountain laurel, flowering crab, Satsuma orange, kumquat, flowering peach and cherry, crabapple, holly, yaupon, giant bamboo and the flowering sweet olive, which fills the garden with its fragrance. Bordering the spacious lawns, driveways and walks throughout the gardens are King Alfred daffodils, iris, pieris, malionia, impatiens, rubrum lilies, boxwood, ophiopogon and the interesting berried plants, ardisia, aucuba and colorful pyracantha. In early April, thousands of rose bushes are in full flower in the attractive Rose Garden. In succession, come the oleander, gardenia, hydrangea, mimosa, crepe myrtle, tung oil tree, althea, southern magnolia, hibiscus, buddleia, daylilies, plumbago, lantana, yucca, bottlebrush, ginger lilies, russclia, allamanda, African violets, water lilies, impatiens, salvia, petunia, vinca and many annuals. In the summer months, the beautiful foliage plants, such as caladium, crown, dracena, pandanus, acalypha, dieffenbachia, achyranthes, pedilanthus and ferns of every description, are on display, as well as the vines of the Confederate jasmine, Carolina jasmine, Rosa de Montana, honeysuckle, ivies, wisteria, climbing roses, bignonia, passion vine, morning glory. To maintain a garden of this magnitude entails the employment throughout the entire year of many trained professionals. This gives one a slight idea of the work involved, which would not be possible were it not for the loyalty and excellent service rendered by the gardeners who have been constantly employed since the gardens were started years ago. Now the gardens are open to the public every day of the year from 8.00 AM. till 5:00. 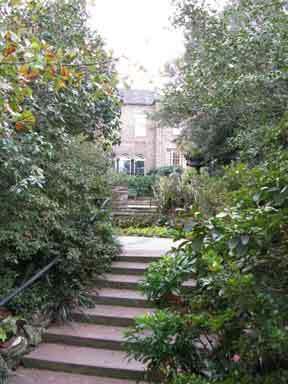 On February 1, 1950, Mr. Bellingrath conveyed the gardens in perpetuity to the Bellingrath Morse Foundation for religious and educational purposes and all proceeds from admissions to the gardens, above the cost of maintenance, are donated to churches and educational institutions, named in the Trust Agreement. The story of Bellingrath Gardens is now perpetuated on a large red Missouri granite Monolith which was presented by Mr. Bellingrath to the Bellingrath Morse Foundation. The Monolith, which is nine feet high and weighs 10 tons, is located in the center of the gardens. Its three large bronze tablets give full information concerning the development of the gardens to the thousands of eager visitors who wish to know the full story of this lovely wonderland.